Contamination from a Wheatfield landfill that housed waste from Love Canal isn't affecting neighboring properties, the state Department of Environmental Conservation said Monday. The DEC announced its study into surface, subsurface and groundwater samples it took around the Niagara Sanitation Landfill on Nash Road over the last year show contaminants have not escaped to threaten neighbors living nearby. 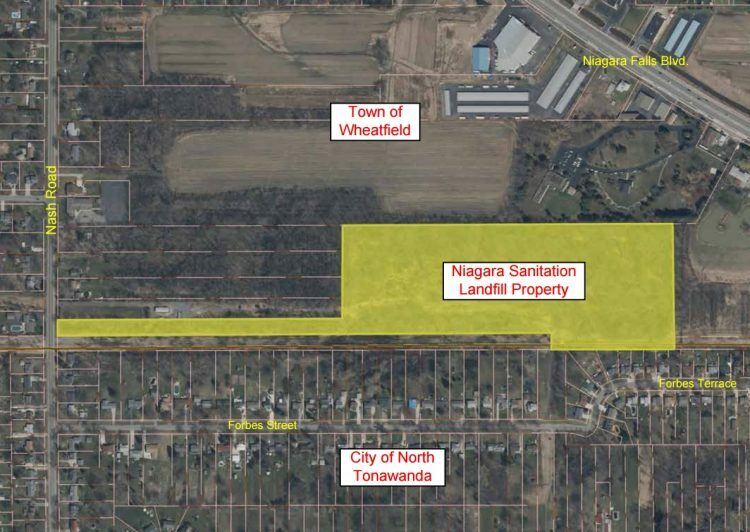 "The results of the DEC's ongoing investigation of the Niagara Sanitation Landfill should be welcome news for the Wheatfield community," said Basil Seggos, the DEC commissioner, in a statement released by the agency. "The supplemental results announced today confirm DEC's initial on-site sampling data and show no off-site contamination." But neighbors reached Monday expressed outrage at the results of the DEC study. "If they are still working for the people of New York State they should be fired and get some competent people in there that know what they're doing," said William Maines, a Forbes Terrace resident who's backyard backs up to the landfill. The DEC said it dug 18 trenches and bored in 13 areas around the landfill's perimeter to find the boundary of the disposal area for the landfill that opened in the 1950s and saw the state Department of Transportation transfer material there from the Love Canal landfill when it built the LaSalle Expressway. State environmental officials reported that more than five dozen groundwater samples from 43 monitoring wells installed at the landfill itself determined that groundwater there is "minimally impacted by low-level contaminants" but pose no public health concern "because there is no exposure pathway." Surface water and sediments "are not significantly impacted by landfill contaminants" from low spots at and near the landfill. Off-site samples taken from 26 sites, including 22 residential properties, showed no impacts from the landfill. Samples on the landfill property found metals and other chemicals "typical of former municipal and industrial dump sites." Although the material from Love Canal was reported to be removed nearly three years ago, nearby residents and their lawyer believe remnants remain that are making them sick. It prompted them to file a lawsuit last year. Residents complain of a myriad of health problems from liver disease and cancers to a host of heart and respiratory problems. Maines said a private environmental testing firm from Boston, Mass. determined a floor drain in his basement was laced with PCBs at rates of 333 parts per billion, pesticide chemicals at 1,844 parts per billion and dioxin at 550 parts per billion. "They told me, 'Mr. Maines, if you were smart, you would get out of your house,'" Maines said. Another neighbor, who didn't want to give his name out of fear of legal reprisals, questioned the scope and thoroughness of the DEC's study. He said the same private environmental firm tested tested both inside and outside of his property, including with such detail as analyzing dust and debris from vacuum cleaners, ceiling fans and plywood. The DEC, he said, merely dug into the surface of the dirt. "The danger is in the ground, not on top of the ground," Maines said. Christen Civiletto, the local environmental lawyer spearheading the legal case for the neighborhood, didn't respond to The News for comment. The DEC acknowledged it was in receipt of some of the data residents' attorneys forwarded via the governor's office about purported scientific analysis from their properties. But officials said it was incomplete. The DEC said that data left out the manner in which the samples were collected, where they were collected or reasonable explanation about the contents of the sampling. Agency officials said residents should feel comforted by the results of the study because the agency contracted with an environmental consulting firm and certified laboratory to perform that sampling and testing. "There's no indication that any contamination had migrated from the landfill," said Chad Staniszewski, a remedial engineer for the DEC's regional office. Sampled sites surrounding the landfill with landowner's permission included those on Forbes Terrace, Forbes Street, Nash Road and Niagara Falls Boulevard. Staniszewski said all but a landowner or two consented to the DEC soil sampling on their properties. "I should think they should feel very comfortable," Staniszewski said. "We did a comprehensive investigation." And, Staniszewski said: "All our data is verified by a third party."